Neither small business nor the bottom 90% of households can afford this "best economy ever." After 10 years of unprecedented goosing, some of the real economy is finally overheating: costs are heating up, unemployment is at historic lows, small business optimism is high, and so on--all classic indicators that the top of this cycle is in. Financial assets have been goosed to record highs in the everything bubble. Buy the dip has worked in stocks, bonds and real estate--what's not to like? The S-Curve (illustrated below) is visible in both natural and human systems. 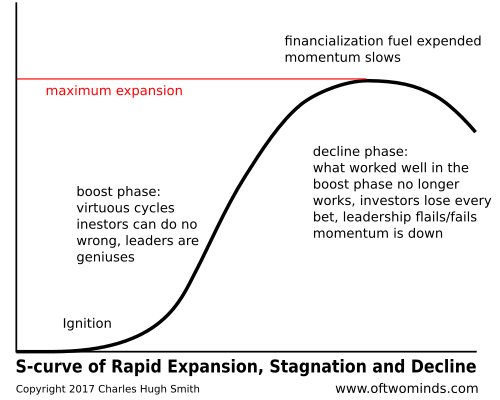 The boost phase of rapid growth/adoption is followed by a linear phase of maturity in which growth/adoption slows as the dynamic has reached into the far corners of the audience / market: everybody already caught the cold, bought Apple stock, etc. The linear stage of maturity is followed by a decline phase that's non-linear. Linear means 1 unit of input yields 1 unit of output. Non-linear means 1 unit of input yields 100 unit of output. In the first case, moving 1 unit of snow clears a modest path. In the second case, moving 1 unit of snow unleashes an avalanche. Ten years after the 2008-09 Global Financial Meltdown, analysts are still trying to understand what happened. For example, the new book Crashed: How a Decade of Financial Crises Changed the World by Adam Tooze is an attempt to autopsy the meltdown and investigate the mindset and assumptions that led to the panicky bailouts and frantic goosing of a third credit/asset bubble--the bubble which is about to pop with even greater non-linear effects. This is the nature of non-linear dynamics: everything is tightly tied to everything else. Tightly bound/connected systems are hyper-coherent, i.e. every component is tightly bound /correlated to other components. This is how the relatively modest-sized subprime mortgage market ($500 billion) almost toppled the entire $200 trillion global financial market. The vast imbalances created by 10 years of unceasing goosing will unleash a non-linear avalanche of reversions to the mean and rapid unwinding of extremes. Consider the impact on hedges, a necessary function of the financial system. With yields so low, the cost of hedging negatively impacts returns, so hedging has been abandoned, trimmed or distilled down to magical-thinking (shorting volatility as the "can't lose" hedge for all circumstances). With shorting volatility being the one-size-fits-all hedge, the signaling value of volatility has been distorted. The same can be said of other measures: the information value of traditional financial signals have been lost due to manipulation and/or goosing. The interconnectedness of global markets means a small blaze in a distant market can quickly become a conflagration. Put these two together and you get a perfect setup for crisis and crash: nobody really knows anything because the signals have been distorted, but everyone thinks they know everything-- sell volatility and buy the dip. It works great until it doesn't. Meanwhile, beneath the "best economy ever" the rot is accelerating. This article on the empty storefronts proliferating throughout New York City's neighborhoods, This Space Available, mentions one dynamic in passing that is an example of the distortions that will be unwound in the next financial crisis. Desperate for yield in the near-zero yield world engineered by central banks, investors have piled into commercial real estate and overpaid for buildings as the bubbles in rents and valuations expanded in tandem. These owners are now trapped: their lenders demand long-term leases that lock in nosebleed rents, but back in the real world, no business can survive paying nosebleed rents, and agreeing to long-term leases in this environment is akin to committing financial suicide. If you actually want to make a profit, it's impossible to do so paying current commercial rent rates. And if you want to retain the absolutely critical flexibility you'll need to adjust as conditions change, you can't sign a long-term lease. Everyone signing a long-term lease today will be declaring bankruptcy in 2019 when the recession trims sales but leaves expenses unchanged. In other words, neither small business nor the bottom 90% of households can afford this "best economy ever." The financial markets have completely disconnected from reality, and the process of reconnection will unravel all the imbalances and extremes and deflate every interconnected bubble. 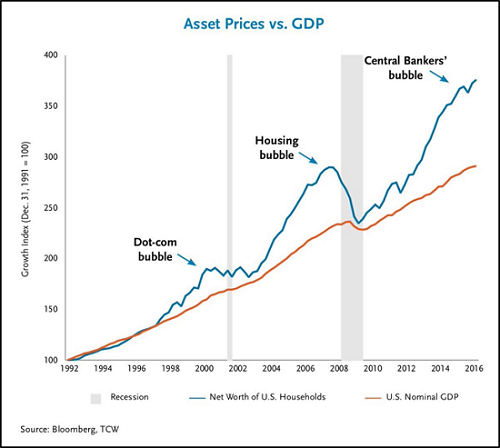 The current fantasy is that bubbles will never pop and recessions are a thing of the past; financial engineering can maintain bubbles and "growth" forever. Everything is distorted to the point that those wandering the hall of mirrors believe they know everything they need to know to continue reaping fat returns on capital. Conventional thinking that performs well in linear eras is disastrously ill-prepared to navigate non-linear eras like the one we'll be entering in 2019--right on schedule. Thank you, Charlene S. ($5/month), for your splendidly generous subscription to this site -- I am greatly honored by your steadfast support and readership. Thank you, Edward C. ($10/month), for your outrageously generous pledge to this site -- I am greatly honored by your support and readership.